As a response to GlowLight by B&N, Amazon has recently introduced a new tablet - Kindle Paperwhite 3G for its e-readers worldwide. 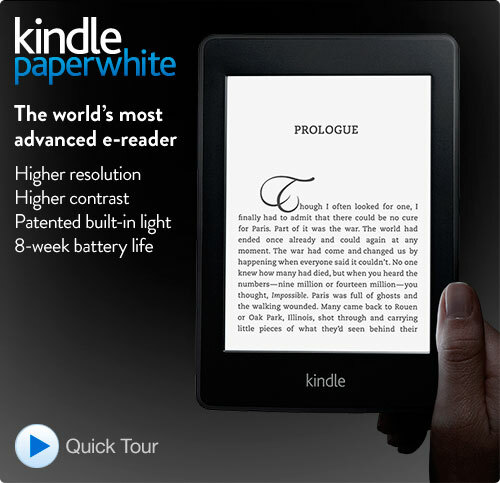 Kindle Paperwhite has been enhanced this time with its glossy black body which weighs 212gms. However, the 3G model weighs 220 grams. It is sleeker, thinner and richer than before! New Kindle Paperwhite measures about 117 x 9 x 170 mm which is tenth of an inch shorter and a few hundredths of an inch thinner than the previous versions. The display is certainly a gem with an improved pixel density of 212 ppi (pixel per inch). The touch is more responsive than Kindle Touch’s and display is brighter than the other competing devices such as GlowLight. As far as the inside is concerned, Paperwhite has improved Home screen now which revives the motivation to read. The Home icon at the left pane of the renewed Kindle toolbar enables you to go back your home screen anytime during navigation. For switching between pages, Kindle Paperwhite’s screen splits into three sections. The section located on the bottom right lets you to navigate through the next page. Whereas, the slimmer section located on left lets you go back to the previous page, and lastly the section on top of the screen brings up Kindle toolbar. The formatting options have also been improved with six font choices, eight choices for size selection and three line spacing and margin settings. The sharpness of the text has increased but to a decent level so the readers can enjoy reading as long as they want. Moreover, an extra feature that has been added in the recent Kindle Paperwhite is “Time to Read” feature which evaluates the time needed to read the selected chapter or section provided the usual reading speed which is quite interesting for the readers.